Sage Comfort Rinse Free Cleansing Shampoo Cap from HealthyKin.com now allows caregivers to have an easy way to help loved ones look good and feel good! Comfort Shampoo Cap provides easy, all-in-one hair care. No more gathering multiple hair care products - everything you need for a warm comfortable shampoo is already in the cap. Rinse-free shampooing and conditioning. 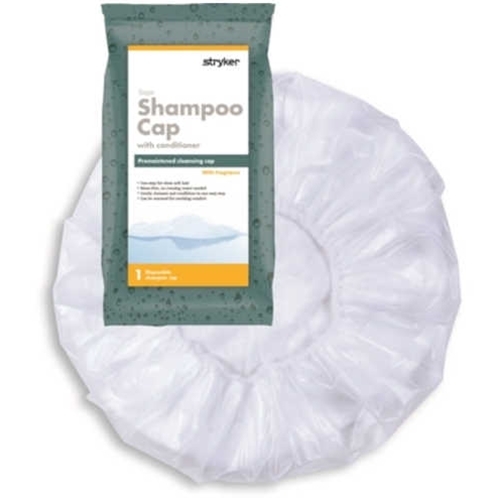 Each ultra-soft, disposable cap is pre-moistened with rinse-free shampoo, conditioner and detangler. Dirt and oils are absorbed into the cap's fabric lining, leaving hair feeling clean, soft, and healthy. Plus, there's no need for running water or the potentially dangerous situation of getting into a tub. And it's warmable, providing the ultimate in comfort. The easiest hair care ever, and it feels great! Purified water (Aqua), Isotearamidopropyl Morpholine Lactate, Disodium Cocoamphodi acetate, DMDM Hydantoin, Phenoxyethanol, Methyl paraben, Butylparaben, Ethylparaben, Propylparaben, Fragrance (Parfum), Simethicone. Great for tracheotomy patients and for those that are unable to wash hair the conventional way. Leaves hair clean and smelling fresh. Mom has late stage Parkinson's and cannot bend her neck. This Shampoo Cap is perfect for ensuring her hair and scalp are clean. She loves the warmth of heating it for 20 seconds - 30 seconds seems to be too hot. Please do NOT include my name or email address. The best invention in the world for my bedridden mom who has Alzheimer's. I love this product! It makes my hair feel so soft and very clean since I am older and don't get in the shower without assistance so this is a great way to get my hair washed in between. Wonderful. As a nurse, our hospital (ICU) did a product trial on these caps many years ago. All the nurses loved them! Now I use them for a bed-ridden family member. This is the best product out there for hair care. I have tried many others & none of them leave hair smelling so clean. I will buy this brand always, it's worth the extra money. Healthykin.com is the cheapest for this brand. Thank you for this great product. These are fantastic for my mother with Alzheimer's disease and is bedridden. We are also happy with the superfast delivery Healthykin provides. I have also told a couple of other folks about these caps and they also have ordered them. So easy to use and I only microwave for 15 seconds. I get these for my neighbor who is elderly and I wash her hair with this. She loves it and says it makes her hair feel so fresh and clean! Great product! This product has certainly met the need in our family for a dear one, who can't wash his own hair!! !